Are you bolder than a Jurassic World dinosaur? Are you a risk taker? How well do you trust your memory? Bold Jurassic World Card Game is a fun matching game that tests how far you're willing to go. Will you take your points and run? 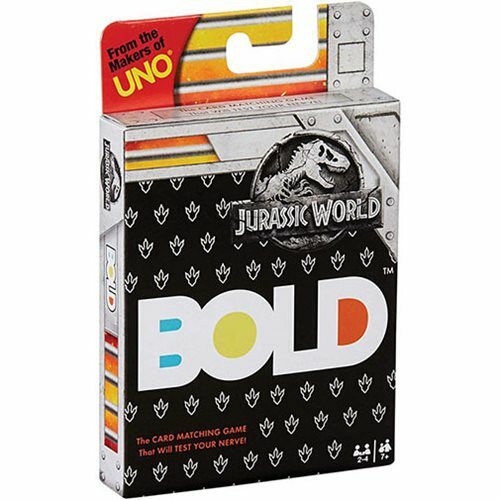 Flip over cards showing images from Jurassic World, and look for matching patterns and/or dinosaurs that in type, color, or size. Now comes a test of your mettle: after you find a pair, will you safely take your points and run or will you gamble by flipping another card hoping it will share a feature with the first two? The Bold Jurassic World Card Game becomes more intense as it goes on and as you remember more! To win this game, you need memory, nerve, and maybe a little luck. 2-4 players, Ages 7 and up.